I got a ‘phone call one night in early November from a farmer to ask if I’d go over that night to see what was about. He went on to say that the local hounds pack had been through, and that he was concerned that some foxes may have been displaced onto his land. Since his business is the raising of free range organic chickens, having any errant Charlies on his land could be disastrous. It’s bad enough when they go on a killing spree, when their instinct takes over and they massacre anything they can get at. Even worse, however, is when they frighten the birds so much that they all pile into a heap and end up getting asphyxiated. When this happens the death toll can run into the hundreds. I therefore waited until it got dark and drove over. The journey – about eight miles of narrow lanes, was just as I like it – uneventful. That meant I hadn’t to reverse up for another vehicle, which I hate doing when there’s every chance that someone will come speeding around a corner and crash into the back of your vehicle. When I parked up, however, it seemed like I’d walked into the middle of World War Three. I’d forgotten that it was Bonfire Night, and it seemed that just about every hamlet, village and town in the area was having a massive fireworks party. In daylight you can barely see any other houses even from high ground, so on any other night you’d have thought you were in the middle of nowhere. The number of rockets whooshing about all over the place then bursting with all the consequential bangs and flashes was bad enough to make me want to turn around and go home straight away. I’d driven all the way there though, so I thought I might as well have a quick look around. The rabbits all appeared to be very nervous, staying close to their burrows and running off at the merest whiff of danger. Still – at least they were out, so there was a chance that a fox or two might be on the prowl. As I walked up the track, however, I realised that between all the bangs and crackles I could also hear the mewing of baby lambs. I knew that Carole, the farmer’s wife, keeps South Dorset sheep, and that their breeding season can be exceptionally early. I was still surprised though, especially at the fact that the ones I was hearing sounded as though they were only a day or two old. 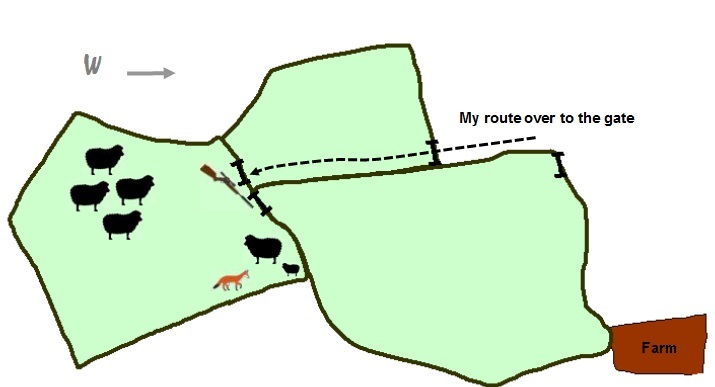 My mind immediately switched on to the fact that all their baa-ing probably came across to any foxes in the vicinity as something akin to a banqueting knell. I therefore decided that it’d be worth making my way through the two intervening fields for a quick inspection. The wind was in my favour, blowing more or less into my face, and there was so much noise coming from all around that in comparison my progress was almost silent. Having negotiated various gates and groin-high electric fences, I neared my goal, which was a long metal gate that overlooked the field in question. Creeping up to it, I found that the sheep were all in a tight circle with the apprehensive ewes protectively surrounding the frightened lambs. This is normally a sign of the presence of predators, but no matter how hard I looked, there was nothing to be seen. I came to the conclusion that maybe that were simply been reacting to the unusual noise and smell of all the fireworks. Even as I stood watching, a trail of sulphurous smoke was drifting up from the valley beyond and flavouring my nostrils with a distinctly acrid aroma. A sixth sense told me otherwise though. Having satisfied myself that there was nothing untoward out in the field, I quietly scaled the gate and because of the wind direction, immediately checked the meadow on the other side of the fence before my scent could give me away. There was nothing there either, however. Sure that something was afoot, I carried on scanning via the NV in a wide sweep. As I came back around to the field I was in I found that from my new position I could now see past the curve in the hedge off to my left and into the corner. Much to my surprise and consternation, I saw before me a desperate ewe backed into the corner doing her best to protect a tiny lamb which was sheltering hopefully behind her. Stood brazenly in front was a large dog fox which had somehow managed to separate them from the rest of the flock. He was clearly intending to make a tasty meal of the frightened little youngster. The scene was almost a caricature of the clichéd ravenous cartoon wolf about to pounce on a defenceless creature. Just as he was about to make his death-dealing leap, the fox realised I was there and turned to look at me. A sudden realisation of the seriousness of his situation seemed to sweep across his visage. Before he could do anything, however, a .22-250 ballistic-tip smacked him hard in the chest and justice was served. Cue the music from the 5th Cavalry appearing over the horizon at the critical moment. Carole later said that she’d been losing young livestock in that field for several years, but after the shooting these loses had stopped. Examination of the carcass certainly backed this up in that the fox was a grand old specimen with a good age, so it’s anyone’s guess just how many lambs, chickens, hedgehogs, and so on he’d killed in his time.